Earlier this evening, 39 math teachers attended a web conference to discuss the “State of the Math Twitter Blogosphere,” a community that comprises many millions of math teachers from god-knows-how-many countries. I’m sure the premise of that conference – that anything these 39 teachers might say or do or decide about any of these questions would have any kind of corporate effect on the community they’re one infinitesimally small part of – was well-meant, but it seemed awfully self-regarding at the same time. The premise frustrated me. My microphone frustrated me also at the exact moment I was going to speak my piece. Here is that piece, polished a little and elaborated quite a lot. It expresses my frustration, yeah, but also a lot of gratitude for a community to which I really probably owe a kidney if it asked. One thousand math teachers will start one thousand new blogs and one thousand new Twitter accounts tomorrow and they will be totally unaware that this conversation ever happened. They will be completely unaware of our corporate resolutions here. This conversation might be ineffective but it might also do some harm. I’m uncomfortable with how concerned we are with the right ways to tweet, blog, collaborate, and socialize online. Because I’ve had that conversation before. For several months on Twitter I didn’t follow anybody. I enjoyed composing silliness in 140 characters but I didn’t yet feel any need to read anybody else’s. And people gave me grief about it. As though there was some right way to do this Internet thing. The resolutions we make as a group here won’t matter at all. They won’t have any effect on the community of which we’re one small particle. But the resolutions we make personally matter enormously – whether you’re read by two people or two hundred or two million. I encourage you to be the blogger and tweeter you want everybody else to be. Imagine if everyone tweeted and blogged like you. (And I don’t mean your ideas and your opinions. That would be boring.) Imagine if everyone shared your ethic and the value you place on community. What kind of online math education community would result? I like reading tweets that use complete sentences and few abbreviations, so that’s how I try to tweet. I like seeing lots of internal and external links in other people’s blog posts so that’s how I try to blog. I like people who criticize me fairly, but seriously, who don’t drape their criticism with qualifiers like “In my opinion” or “Don’t take this the wrong way” or “I’m not trying to be mean.” So that’s how I try to criticize. As I and my blog have changed over seven years, I’ve found different ways to express that ethic to my community. Here is a fly-by of those changes, in case they’re of any use to you. I blogged like no one was reading. Bloggers come and go. The bloggers that have stayed all seem to recommend this. I tried to have an opinion. Most of them were wrong, but I respected bloggers who wrote about their own opinions as well other people’s. So that’s how I wrote. I blogged under my own name. There are plenty of good reasons to blog anonymously, but if that isn’t your explicit goal, you should spackle your identity – including your name and photo – all over your blog. It’s amazing how many times I read some great idea from some new blog and I want to holler that blogger’s name from the Twitter rooftops only to have to apply some serious Google-fu to find it. I asked explicitly for criticism. You may tell yourself you’d happily accept criticism, but no one will offer it unless you ask for it explicitly, repeatedly, and then respond gratefully to the criticism that’s helpful and then ask for more. Eventually you won’t have to. At the moment, no one does this better or more consistently than Michael Pershan. None of his readers can seriously doubt his gratitude and eagerness for criticism. It’s his ethic. I started to “feature” comments. I wanted to build a community around here, to celebrate good ideas and good criticism apart from my own, so I started pulling useful comments up to the main post and then telling those commenters I appreciated their comments. I appreciated how seriously other blogs took comments and I wanted to be that kind of blogger. I try to turn interesting opportunities into blog posts. Your name and contact information are on your blog, right? As people contact you for increasingly interesting projects and opportunities, you can share that learning with people who didn’t have your same blind-stupid luck. I answer every email. This isn’t true, but it’s close to true and I absolutely want it to be true. I have an email in my inbox right now from a first-year teacher I know nothing about asking me whether he should take a job offer at one school or another. I get emails from parents – really desperate parents – who want their children to be challenged less by math (and sometimes to be challenged more), from principals who want to know how to change their math faculty’s approach to teaching, from Chinese students who’d like to tell me what math is like in their country, from sympathizers, from antagonists. I answer (nearly) all of these because that’s how I’d like this community to be. I try to highlight the best of new blogs. This “Great Classroom Action” feature suddenly overwhelmed me a few months ago because there was so much of that action and you guys were so good at capturing it. But I’ll pick that back up. It’s important. When I was in the classroom, I could contribute the action. Now that I’m not, all I can do is read the blogs so you don’t have to. I hoover up every RSS subscription I can, scan every post, and keep my eye out for images of students doing interesting, challenging mathematics. I try to create more value here than I’ve captured. This has become increasingly difficult because I am enriched by you all every day in new and different and more extravagant ways, which challenges me to find ways to create the same kind of extravagant value. Your generosity makes reciprocity very difficult, but I volunteer for webinars, hop on phone calls, answer emails, contribute feedback on curriculum projects, and write appreciative notes to your students who catch my errors. I don’t know if I’ll ever find enough ways to pitch in. This is how I do online community not because it’s the right way or the only way to do online community but because it’s how I want this online community to look. I’m not asking anyone here to be like me. I’m not asking anyone here to resolve to do anything corporately. I don’t think those resolutions will have any effect. I’m asking you to consider how you’d like this community to look and then to act accordingly. I can’t speak with enough gratitude for this place and I’m excited to see what you all make of it and what it makes of all of you. 2013 Jun 25. I update posts, even ones that are millions of years old, because I love coming across other people’s old posts that show not just their current thinking or their oldest thinking but the progression from one to the other. I don’t think it’s a matter of being concerned with the ‘right’ way, so much as the ‘most effective’ way … or perhaps the ‘less ineffective’ way. But Chris asked some great questions and people came up with lots of thoughts to share about them. No one was trying to delineate the “right ways” to interact online. For crying out loud, it was a conversation that was centered around helping people feel more welcome and comfortable joining in whenever and however possible. But I want say that I see how the title of this post, the tone of the first few paragraphs, along with whatever esteem this community has for me has had the cumulative effective of making some of you shocked and defensive, and in no position to give those ideas that close read. I am sorry for that, both because I’ve distracted the conversation from the 90% of this post that I actually care about but especially because I like you guys and your work and would never want you to feel small on my account. This task comes from the Mathematics Vision Project, a free curriculum from some sharp Utah educators. This is the first task in their “Secondary One” curriculum, a variation on the classic Pool Border task. Reduce the literacy demand. There’s a lot of text here boxing out English Language Learners and obscuring the point of the task. Much of that text exists only to service the story surrounding the problem – this school administration replacing tile in the cafeteria. I’ll argue later this story buys us very little while the text it requires costs us quite a lot. Start the problem with a concise, concrete question. Let’s not bury the point of the problem. Let’s tell students what we’re doing here as soon as possible, as quickly as possible, with as little jargon and in as few words and syllables as possible. Keep it to a tweet. Add intuition. Let’s make that initial question something students can guess at. This is my go-to. I’d be surprised if it didn’t feature in every single makeover this summer. It’s the easiest, cheapest move I can make to get students to commit to a task. Scaffold the move to generalization. 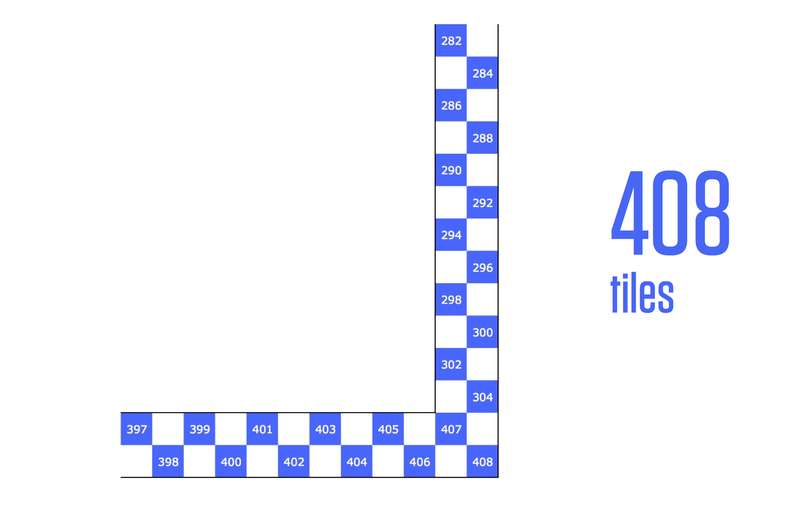 The task moves straight from “count the number of tiles in a single small instance of the pattern” to “generalize the pattern” and I’m not confident the pattern will be clear to the student. 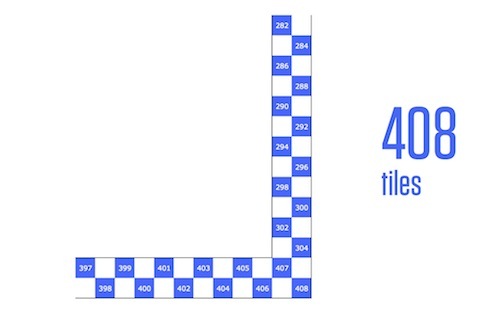 Bree Murray thinks the domain of the pattern is only even-numbered squares, for instance. She may be right but I interpret the problem to include all whole numbers. This is not the good kind of ambiguity. Open the problem up to more than one possible generalization. I can see at least two ways to generalize the pattern. 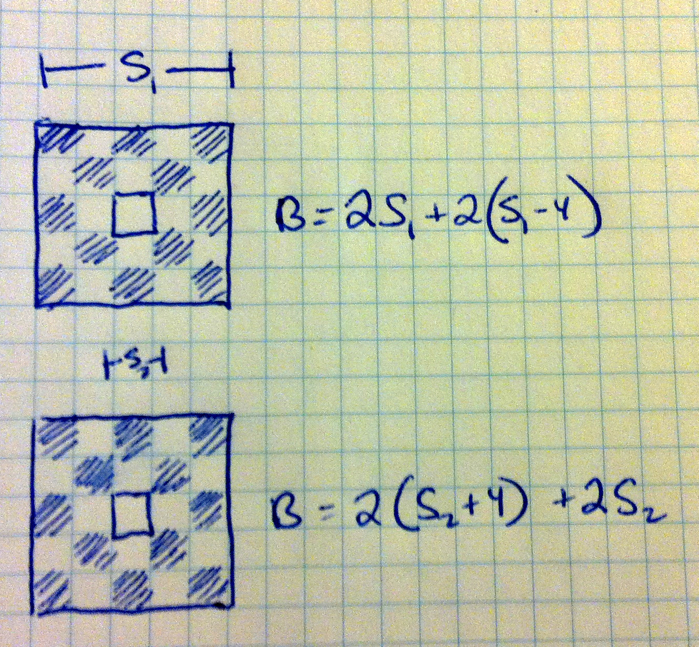 One defines itself in terms of the large boundary square and the other defines itself in terms of the small inset square. Defining the pattern by the large boundary square felt most natural to me. 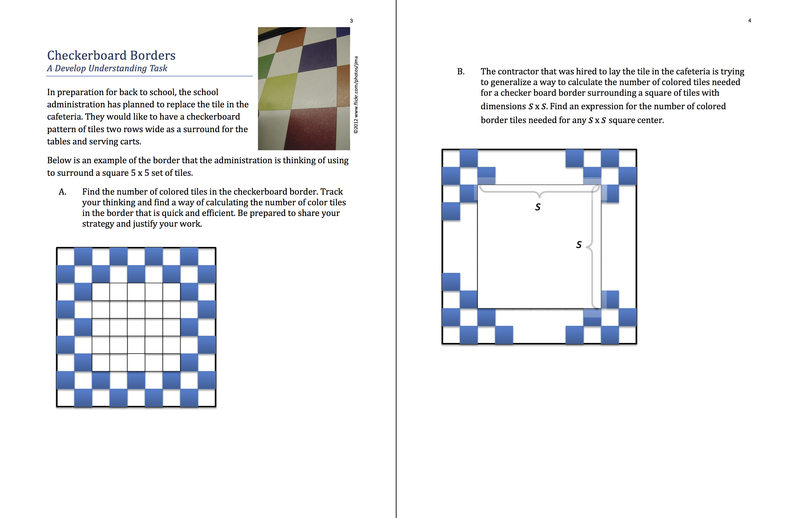 The task authors force the student to define the pattern by the small inset square. We’re losing mathematical richness and student creativity there and, aside from easier grading, I’m not sure what we’re picking up on the other side of the trade. Raise the ceiling on this task. In addition to lowering the floor with all the guessing and scaffolds we’ve already added, if a student figures out how to generalize quickly, can we raise the ceiling with extra questions that will provoke her to develop the concepts further? Show this image for a few seconds. Ask them to think-pair-share their guess. 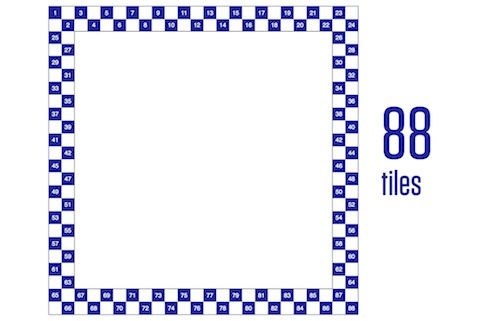 Ask them to write down a number of blue tiles they know is too high and a number they know is too low. Pass out this handout [pdf]. It has the four earliest iterations of the pattern. They have to count and/or construct each one, which should give them a better intuition for the pattern than the original task does. Ask them to share how they’re thinking about the number of blue tiles. They’ll help each other here. Then show them the twentieth iteration and see if they were right. Now we tackle the huge square. We give students the information they want. The huge square is the 100th version of the pattern. 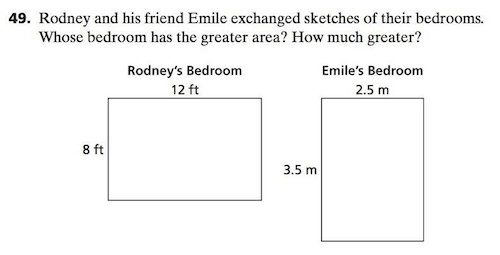 Ask them to take their answer for the huge square and reconcile it against the error boundaries they set up earlier. If students generalize to a formula in different ways, show those different formulas and connect them to the ways of thinking they shared earlier. Ask students to reconcile the differences. How are the formulas different? How could they turn one formula into the other? Ask them what numbers of blue tiles they’ll never ever see. We’re trying to challenge students who finish quickly here and buy ourselves some time to help students who need it. Show the answer. Find out who had the closest original guess. Have the class give that student one clap. The usually stalwart Chris Lusto threw in the towel immediately. James Cleveland thought the problem could stand as is. Jennifer Silverman created a Geogebra applet. We had a split decision, she and I, on whether students would get better intuition for the pattern by having Geogebra create it dynamically or drawing it themselves. Beth Ferguson motivates the move to generalization by posing a school administration that quickly and repeatedly changes its mind on the dimensions of the cafeteria. That’s great. I’m curious what sending students to the cafeteria buys us here in exchange for the time it costs. Mary Dooms pulls a nifty trick by taking a task that’s fully prescribed and makes it both harder (students have to ask themselves “What information is important here?”) and more fun (students get to be creative and autonomous) at the same time. That isn’t easy. Jonathan Claydon modifies another task that moves to generalization way too quickly. What does the real world buy us here? I know what the cafeteria context costs us. It costs us an extra page to include all that text. It costs us some participation from our English Language Learners. That’s fine if we get something worth all that cost, but I can’t see what we’re getting. Lately, when I work with math teachers, I encounter a particular theory of student engagement that says, “Make the problem about something the students are familiar with or which is close to their everyday lived experience.” On Twitter, for instance, Sarah Lowe suggests students may be more intrigued by stones or gardens. I don’t think this is wrong. But I think we overestimate the effect of swapping the context from checkerboard cafeteria tiles to a checkerboard dance floor or a checkerboard stone walkway or a checkerboard pizza platter while leaving the rest of the task intact. I just don’t think students are that easily placated, so I haven’t focused on context at all in my makeover. 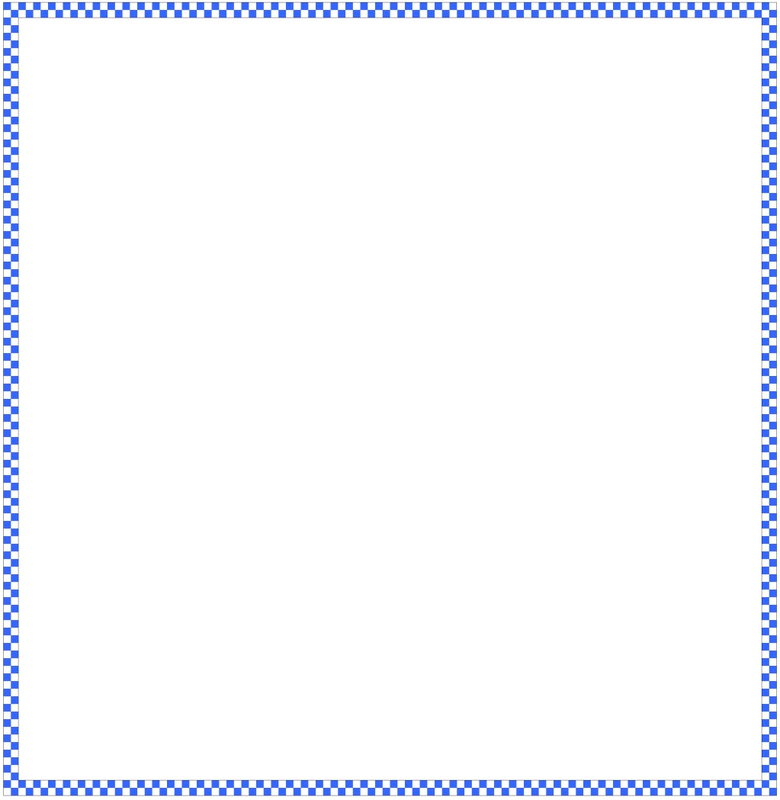 We’re just counting up abstract blue tiles in my task. Instead I’ve tried to start the task easy enough to bring in a lot of students and end hard enough to be worth their time, with or without any context. I’d like someone to convince me that adding a context would raise a student’s heart rate over this problem, but I have a hard time seeing it. I just did this activity in my College Algebra course (I teach at a two-year college) as an introduction to sequences and series. 19 students in class, 18 participated. (1 student walked out and came back when the activity was over.) I teach in an ‘active learning classroom’ with desks set up in groups. 4 groups of students working the problem together and individually. 3 different models for the pattern were given to me. I had already created my own model, and the 3 in class were all different from mine. Each group explained their thinking. Most had not generalized their approach into algebra. I helped them put it into algebra. I also showed that we could simplify the algebra for each approach and end up with the same thing! I was surprised how long it took them to come up with the pattern. I had to ‘nudge’ one table along and point out an error in their thinking at another table. 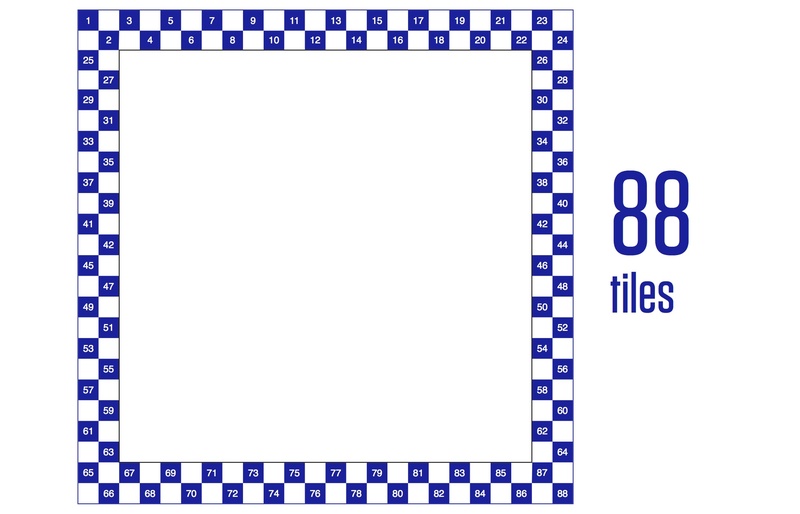 The process of coming up with 88 tiles for the 20th iteration took over 10 minutes. I was happy to see so many different approaches to solve the problem. Things also ‘felt different’ in the classroom. Working to figure out a problem like this is much different than working on the process of completing a square. Different people were taking the lead and speaking up to help their group mates. It was great! I was able to use this task as a reference right away. For example, when introducing the idea about the domain of a sequence, which normally is very confusing, I referenced the iteration # in this task and the students seemed more able to make the connection. I didn’t realize the importance of telling the students the handout referred to the first, second, third and (draw-in) fourth iteration until after I handed it out. I had to go to each table numerous times and show them which one was #1, #2, etc… In the future, I would label the handout first. This activity took about 20 minutes from start to finish. I definitely think it was time well spent! Thanks! @ddmeyer I think of it as subtracting debt repeatedly, or reducing the money loss until you get a gain. @ddmeyer taking away a penalty in football moves the team forward. @PaiMath @ddmeyer Somewhat. From what I know neg #s were invented for debt. Once they exist, we might ask what happens when we multiply? We know how to add and subtract positive numbers, sure, but we can also multiply and divide them. Is the same true of negative numbers? What would multiplying and dividing negative numbers look like? What are your theories? Students will commit to difficult math work if we can cite some job that uses that math or some moment where it occurs in the world outside the math classroom. Students will commit to difficult math work if we can put our students in a position to experience what’s curious and perplexing about it. There’s some overlap, sure, but not a lot. Over a year, those organizing principles create very different classrooms. Over a career, those organizing principles create very different teachers. Let’s talk about those differences in the comments. Samuel Otten’s Cornered by the Real World. I am not sure why these need to be either/or or why they rise to organizing principles. Just based on the history of mathematics, some parts of it are very practical and driven by the real world. Other parts are more abstract and were discovered and elaborated long before anybody found a practical use for them or a connection to the rest of mathematics. The “because you need this” and “because it’s possible” are going to tap different kids, and shouldn’t I be trying to inspire them all? Many of the examples you shared did not apparently address multiplication. For example, some of them gave an explanation for why the negative of a negative number is positive, which is not quite the same thing as explaining why a negative number times a negative number is positive. On the present question, about Dan’s two alternatives for organizing a math class, I prefer the second. Creating perplexity and curiosity in students requires that they have some comfort and understanding that leads to a little intuition or projection that can appear to be contradicted by something, hence the surprise. If a student simply gets used to applying a formula that they don’t understand, then it is difficult to surprise them about a result related to that formula. 2014 Mar 10. James Key contributes a valuable entry to our project. Simplify the prompt. It’s already pretty spare, but I’m going to get rid of the information for a minute. Add intuition. A choice between two items like this lends itself really well to a guess. But when the information is already included, students will start to calculate right away. Justify the constraints. One set of dimensions is given in feet and the other in meters. Why? Is that just a contrivance for the sake of a math problem? That’s everything. If I’m teaching this material tomorrow, I don’t have time to whip up a video or a photo. I’ll ask them to write down their guesses, then share with a neighbor. Then we’ll take a quick poll. 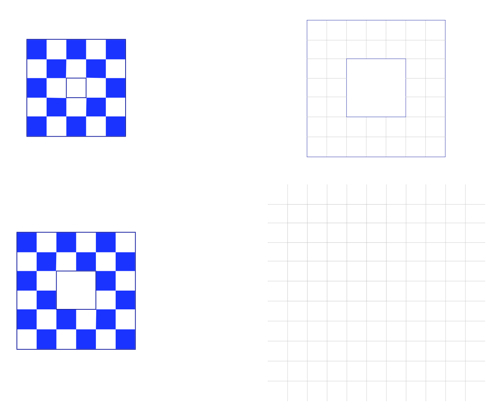 A student may ask if the two drawings are at the same scale, which would make for a nice, quick discussion (“Good eye. That’s really important to know. They are.) but it isn’t an essential moment. I imagine most students will convert the meters to feet. But some may run the other way. Do they arrive at the same conclusion? I imagine most students will convert the linear dimensions and then multiply. But will other students multiply the linear dimensions and then convert the area? Will they arrive at the same conclusion? If they convert in their last step, will they multiply by the conversion factor twice as they should? (ie. 2.5m • 3.5m • 3.28 f/m • 3.28 f/m) or just once? If no one makes that error, I’m for sure going to throw it out there that “a student from another class got a different answer.” Then they’ll construct an argument for or against. 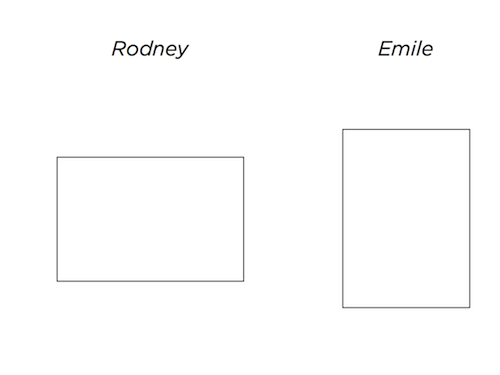 Andrew Shauver made Rodney and Emile brother and sister and brought in some realia with a floor plan. Caren Hickman makes over a different task, one about food, with the goal of using real data and giving students some choice over the constraints of the problem. @ddmeyer Picture of soccer field vs picture of football field. Soccer data in m and football in yards. Which one is bigger? @ddmeyer 1) Draw a picture of your bedroom. 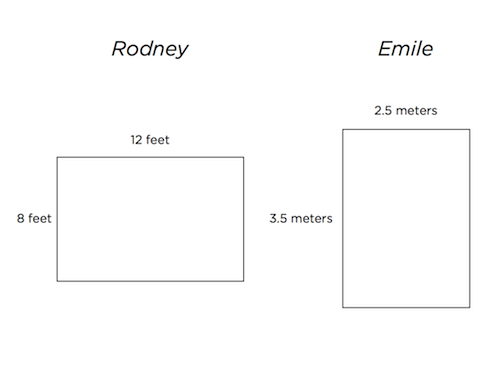 Estimate the dimensions (don't specify which units); 2) Who has the biggest bedroom? If you have a textbook task you’d like us to consider, you can feel free to e-mail it. Include the name of the textbook it came from. Or, if you have a blog, post your own makeover and send me a link. I’ll feature it in my own weekly installment. I’m at dan@mrmeyer.com.